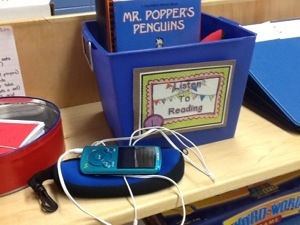 Here is our small but popular “Listen to Reading” area. I have four MP3 players and I bought small cases at the dollar store. Some of the audiobooks have a text to go with and some do not. 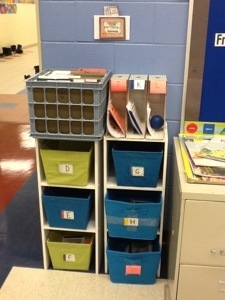 Students have not been using these in my classroom but instead take them to their regular classroom or home. 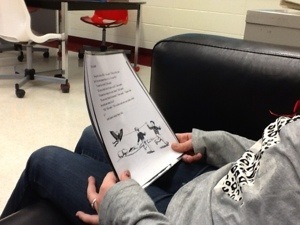 In this way students have been able to read some of the same books as their peers. This has generated some real excitement and given the students that see me the chance to have a book report on display depicting an age appropriate book. One great resource for audiobooks has been AERO. Posted in Reading and tagged daily five, Listen, reading. Bookmark the permalink. I want to adapt the daily five to the resource room for three reasons: I want my students to read independently each day, write each day, and have regular conferences with me. There are some big challenges to adapting this format to the resource room. One challenge is finding reading passages that are at an independent reading level for my students but at the same time are age appropriate (and appealing). Over the break I took different black line masters from teachers in other grades, cut off any grade level labelling, cut off any babyish pictures, laminated and levelled. This has become our “Read to Someone” station. This is working well so far since the levels are good and the length of the passages is very manageable. I feel like students have been pleasantly surprised at their success and enjoyment of daily reading (keep in mind that these are self professed book haters). I am excited to think through each of The Daily Five. Posted in Classroom, Reading, writing and tagged listening, reading, Writing. Bookmark the permalink. I never get to say as much as I would like to at parent teacher conferences. Sometimes I feel like I talk so fast I must overwhelm parents. Other times I wish I had explained things better. One solution to this problem is a brochure. I created a brochure about my classroom to explain my goals, what is important to me, and the type of services that the resource room offers. 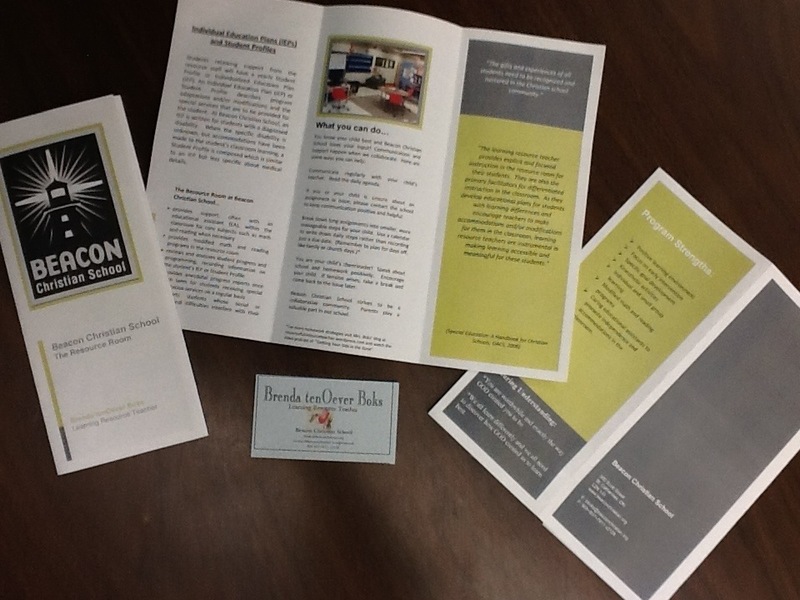 I used the brochure to explain some of the terms and paperwork used in the resource department. I also made my own business card so that when I tell parents to contact me or make an appointment, I have a quick visual and concrete way of inviting them to actually email or give me a call. Posted in Classroom and tagged brochures, conferences, parents. Bookmark the permalink. I enjoy the excitement of a fresh start. Rearranging furniture, redecorating, reorganizing, refreshing… I wanted this new year, this return after a break, to renew my students’ motivation. One of our areas of renewal has been getting comfortable with a new app called Word Q. This is a more expensive app ($25) but a license for Word Q on the PC is $199. Word Q is a word predictor program – it predicts possible word choices as the student types. The student can choose one of the predicted words or keep typing. Each word is read back to the student. There are other great features – it will read back the whole passage, give word suggestions, give definitions, to name a few. Along with getting familiar with this app we now have an air-print printer, so that students can print from their iPads, and wireless keyboards to make typing easier. Add headphones and we have a very productive class. I felt so encouraged yesterday to watch four students, each with headphones on, typing away at book reports. They were motivated! The best part was their confidence that they had spelled words properly and knew that what they had written made sense because they had heard it read back to them. I was impressed with the clear thoughts that they were able to express with very little help from me. 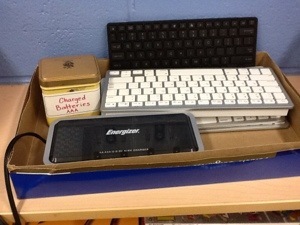 I think my students were re-energized but know that I felt rejuvenated! A writing assignment went from groans to cheers. Yay! Posted in writing and tagged app, ipad, word prediction, Writing. Bookmark the permalink. Anchor Charts are charts that teachers (or parents) and students create together to provide students with a visual reminder of the lesson taught. Anchor charts serve as a reference for students, helping them become more independent in a task. 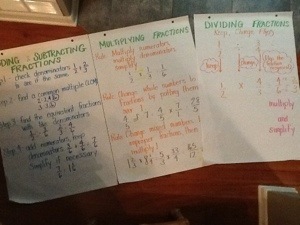 Anchor charts can be used at home too. I have made them as a reference of what to put in a lunch, a friend of mine has one hanging in her mudroom to remind her children of the “getting home and putting away shoes, coats, backpacks and lunches” routine. In my classroom I made an anchor chart with a sequence of photos to make physiotherapy exercises a more independent routine. Anchor chart – a very useful and visual tool. 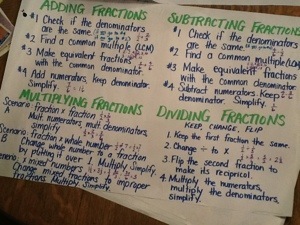 Posted in Kids, Math and tagged anchor charts, fractions, independent, reminders, visual. Bookmark the permalink.